Having attended Mizzou, where football reigns supreme as a time-honored tradition, I was immediately intrigued when I learned that Georgia State has its inaugural football season this fall. © 2010 by The Atlanta Journal-Constitution. (Click on the image above to read the related article on ajc.com.) 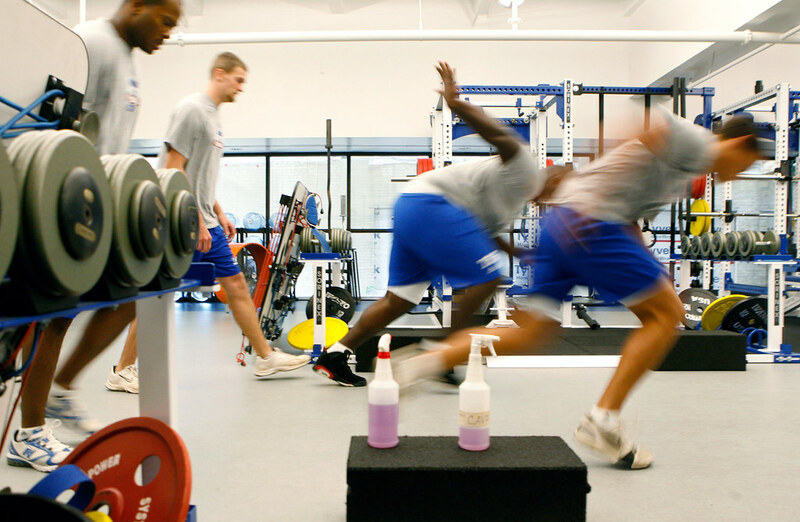 Members of Georgia State's new football team run short sprints during weight and conditioning training in the athletic department's workout room on Thursday, July 1, 2010. The team will play its first game against Shorter University on Sept. 2. © 2010 by The Atlanta Journal-Constitution. 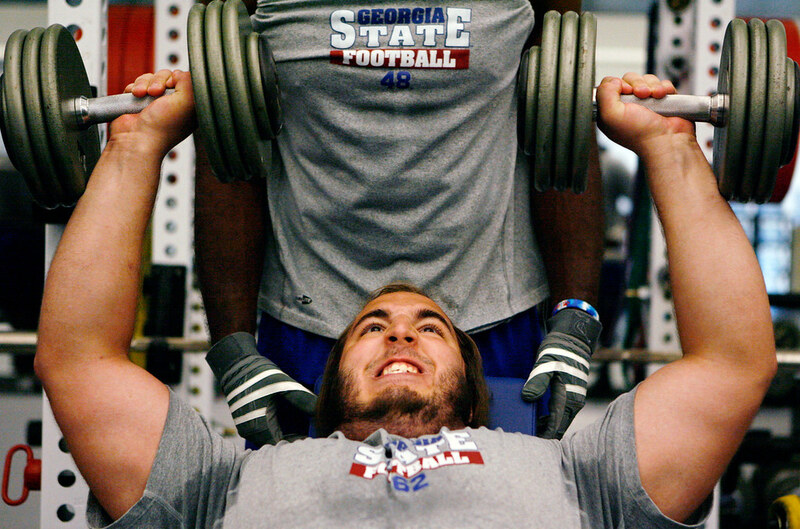 Georgia State junior center Ben Jacoby lifts free weights as junior running back Malcolm Smith spots, in the Georgia State workout room on Thursday, July 1, 2010. The university started recruiting players two years ago in anticipation of its inaugural football season this year. I freelance for the AJC and just wanted to let you know I’ve been enjoying your work. Good luck with the internship. Thanks Josh! I checked out your blog — it looks great! I wonder how adding a football team has effected the school’s Title IX program. That’s a lot of male athletes to add, have they also added women’s programs? There are a couple different ways to comply with Title IX, I wonder which method this school uses. I frankly have no clue… I’m not too familiar with college athletics regulations, unless it’s regarding media and photography. That said, instating a new football team is a huge undertaking in terms of marketing and scheduling and so many other aspects.